‘Twas the best of times, ’twas the blurst of times. 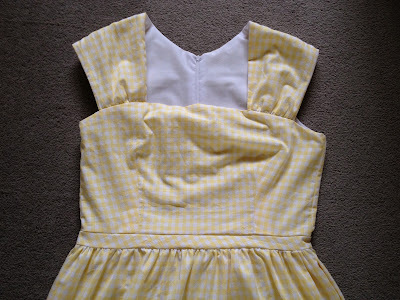 The best of times: I made myself a cute as a button Cambie dress. But Amanda, I hear you say. That dress looks like it is fitting fine. Well, gentle readers, I must admit to gathering the excess fabric at the back of the dress using clothes pegs. Yup. I have used the most dastardly of Hollywood magazine cover tricks used to make their models/random celebs look like a gown had been custom fit. Oh, humble clothes pegs, how I love thee! Also, pardon the ridiculously hideous photograph. 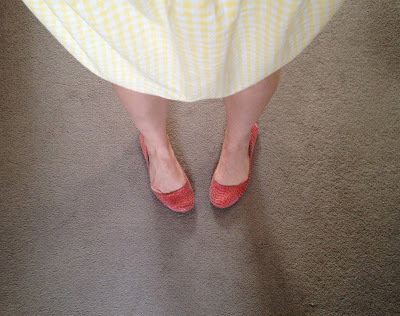 I am still recovering from my virus/sinus infection combo and am not game to go outside in a Canberra winter wearing a sundress at this time of year. Brrrr! I have to say the stretching of the fabric really disappointed me. I was really pleased with my attention to detail on this dress and it felt like I could see how far my sewing skills had come since December. I mean, look at how lovely my lining is where it attaches to the zip. Dreamy, no? I had to make a couple of adjustments to the fit of this dress while crafting up my muslin of awesomeness. Sewaholic patterns are designed with a pear shaped figure in mind and I found that my measurements were a bit all over the place. In the end I cut a 14 in the bodice and graded down to a 10 in the skirt. 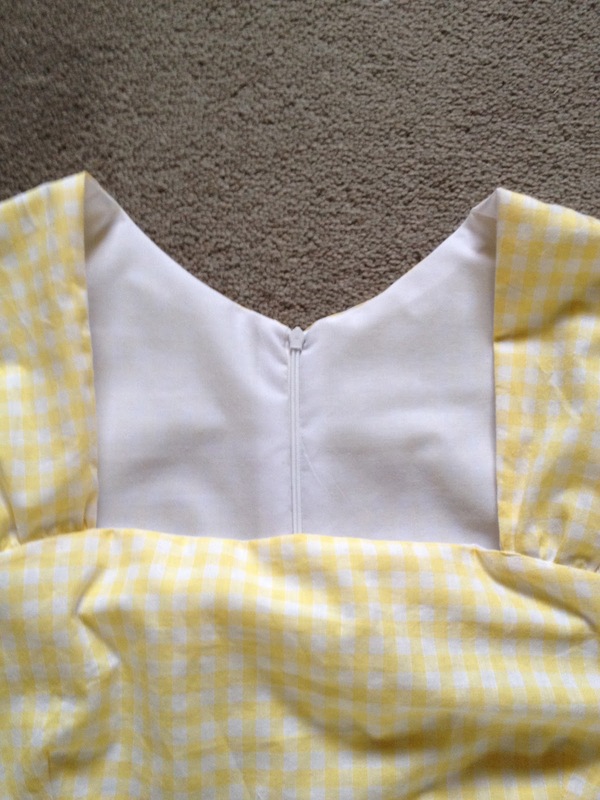 I shortened the darts on the front of the bodice as well as made them a little wider at the base. I also took in fabric on either side of the back centre seam to ensure the back of the bodice sat flat and didn’t gape. I then used Tasia’s tutorial for straightening the neckline. 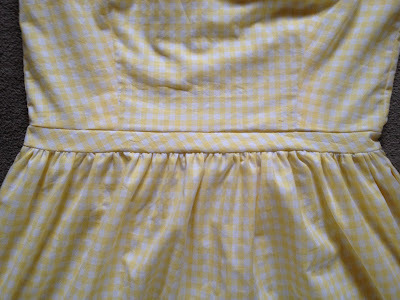 And then it was time to sew up a cute as a button sunshiney yellow summer dress to chase my winter sickness blues away! Tasia’s instructions were very clear and well laid out. The language used was easy to follow and the steps logical. I’m loving the Sewaholic patterns. The lining tutorial that I found to give a professional finish to the lining. It looks so fancy! The bodice and cap sleeves. It’s adorable and I would love to make up a light wool one for work with the a-line skirt. Use a more stable fabric. I really did not expect the gingham to stretch at all let alone as much as they did. Try the a-line verison. While I like a cute gathered dress, I also like the look of an a-line skirt and this would work well with a heavier fabric weight. Look more carefully at the size of my checks next time. I was trying to be fancy and cut the checks on the bias to make the waistband a cute feature. What I didn’t realise until too late was the checks are rectangular not square so the effect is a bit lopsided instead of eye-catchingly awesome. But, hey- maybe lopsided is the new eye-catchingly awesome? So in the end I have a gorgeous sundress that is too big for me. I’m currently debating whether or not to take this in to fit as it will be quite a bit of work. On the plus side, I’ve learnt to be a lot more careful about checking the stability and stretch in fabric before sewing away. 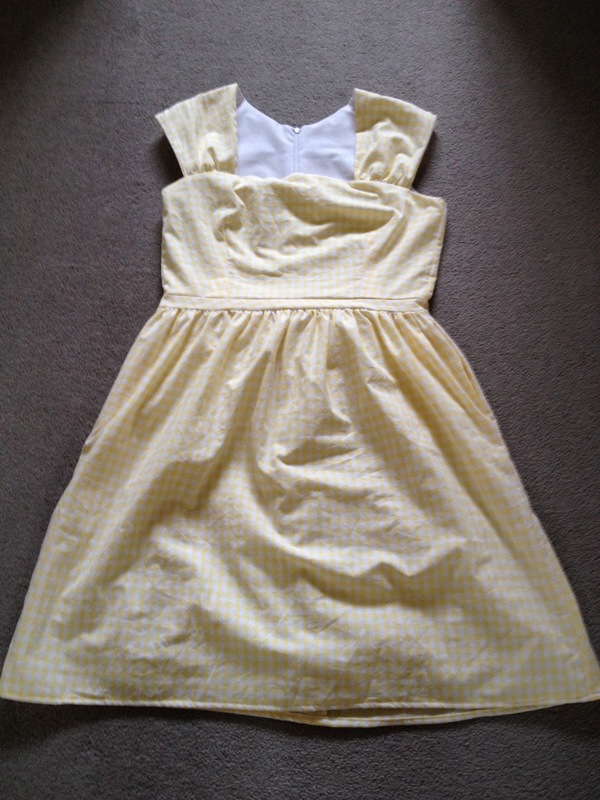 I’m calling this dress a learning new skills win! If only I could train them to bring me cakes and those little barrels around their neck with cocktails in them for when I am sick! The dress looks fantastic!!!! Lining and zipper: AMAZING. Thanks, Neeno! I am really happy with how it looks and the detail… Except for the stretched fabric. Heart breaking! argh! Such a cute dress and you must feel like throwing a bolt (lightening) at the fabric gods for doing this to you!!! I love the sunshine yellow gingham and the squared neckline looks great on you. I agree it’s a huge amount of work to get it to fit. If it’s any consolation my second Cambie came together in no time. And my third (yes another one!) is screaming along at a great pace and I don’t need the instructions. Bwah ha ha! I am so about the bolt throwing at this stage, Lizzy. I’m glad to hear yours have come together so quickly once the fit was right. I’m going to rest this pattern until I find some great fabric and then have a go at it again. I’m thinking a big loud print for some extra sass! Gillian- I swear there was a fist shake and everything when I tried it on! That’s a good idea with just adjusting the back zip- it may be a simple fix and I would love to keep the frock. I’ll keep you posted! Julie- I have so learnt my lesson! I think it has stretched up to a 16 in the bodice… The idea of letting it go pains me but if my fixing attempts don’t work it may be the ticket! And, thanks! Thanks, Symon! It makes me think of summer and margaritas and reading books outside in the shade. I’m going to try and salvage if I can!